If you have hip pain or other concerns, or if you have been diagnosed with a hip problem, Dr. Wolff will work with you to design a personal care plan aimed at restoring you to pain-free function. If surgery is necessary, rest assured that he has the expertise needed to yield a positive outcome. In fact, Dr. Wolff’s entire practice is dedicated to surgical and non-surgical treatment of athletic hip injuries and hip preservation. He performs approximately 300 arthroscopic hip surgeries each year. 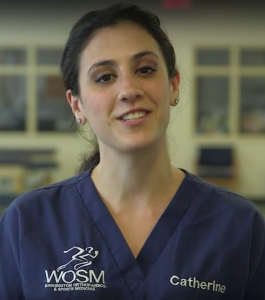 Hi, my name is Catherine and I am Dr. Wolff’s medical assistant. My role is to help both administratively and medically. I am here to answer any questions or address any concerns you may have from scheduling your visits to setting up your surgery. If you are a new patient and have not yet made an appointment with us, please fill in and submit the below form. If you have already filled in the below form and made your first appointment with us, and would like to fill in the required patient forms before arriving for your first visit, click here.